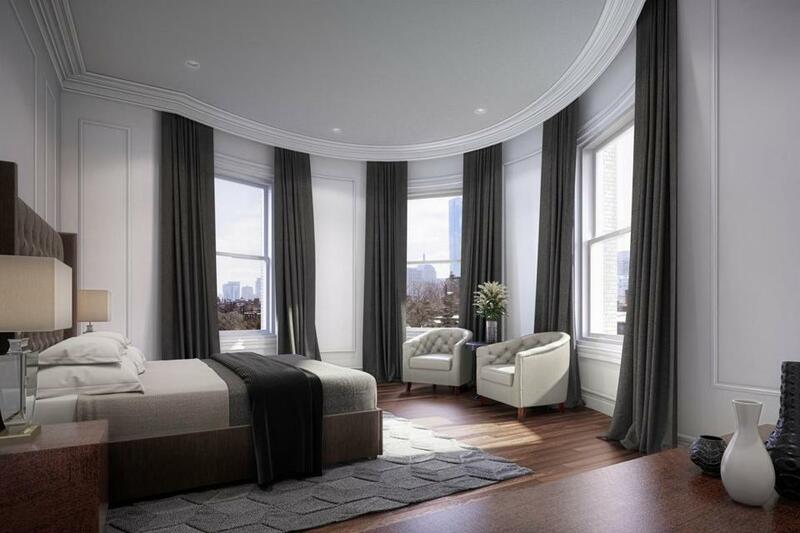 The Hooper Mansion at 448 Beacon St. is undergoing conversion into six condos. In three storied Boston properties, history is repeating itself — and being preserved. When the Back Bay’s Gilded Age manors outlived their desirability as millionaires’ residences, they were ripe for use as office space. Now their ritzy attributes have them undergoing residential reconversion and fetching millions on the market. 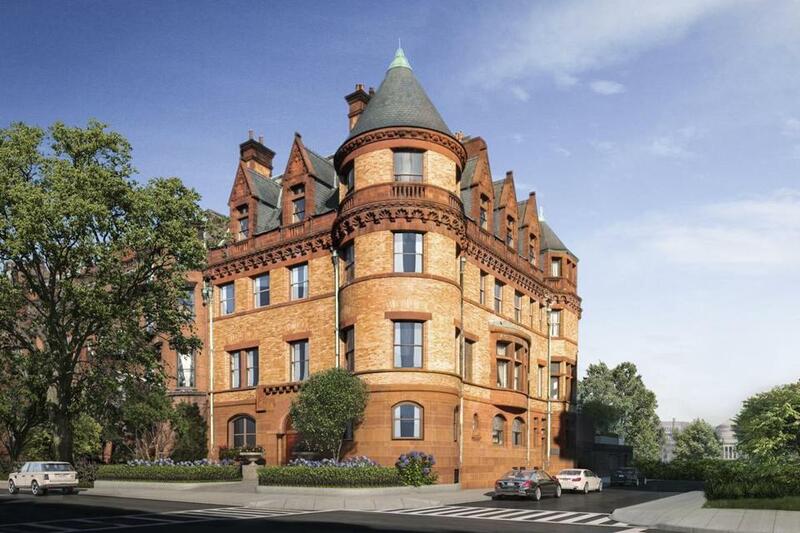 Congress Group of Boston is redeveloping the 1889 mansion into six two- to four-bedroom condominiums, due for completion in June. 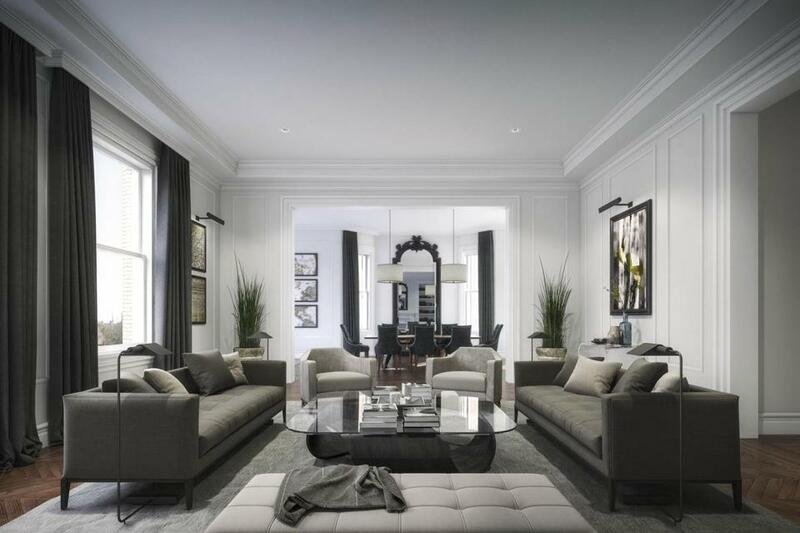 Three of the units in the Residences at Hooper Mansion have sold. The four-bedroom, six-bath penthouse duplex encompassing the landmark corner turret and lancet-gabled dormers reportedly went under agreement for $13.25 million. 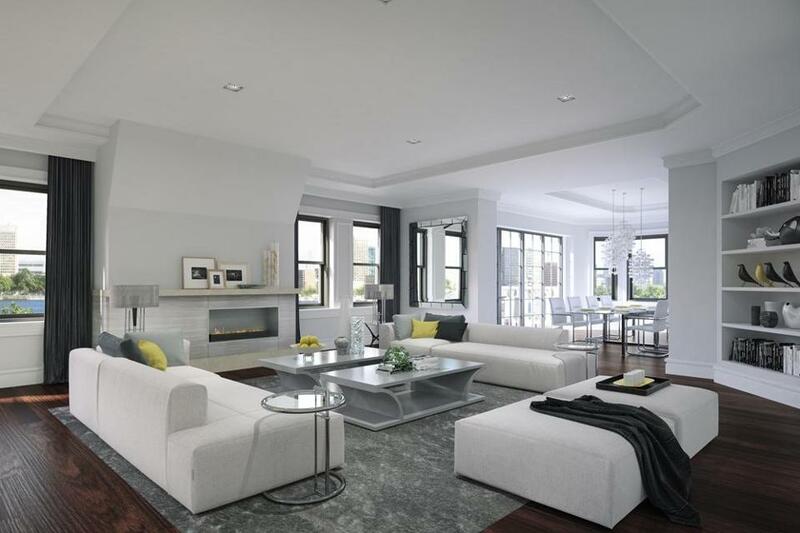 Unit 4 — a four-bedroom, 4½-bath condo that occupies the entire second floor — is priced at $9.85 million. 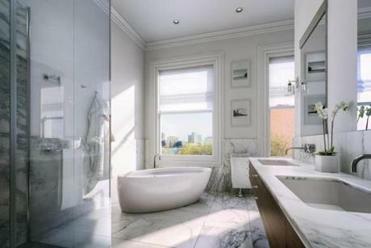 New finishes include paneled wainscoting, triple crown moldings, and Calacatta marble kitchens and baths. “Unit 4 has one of the largest bay windows I’ve seen in the city, and it looks directly at the Charles River,” said Chris Tuite, an owner and broker at Pioneer Realty Group, a Boston firm. Ranging from 1,288 to 6,252 square feet, the units feel mansion-like, thanks to the restored Chateauesque exterior of variegated yellow-orange brick and carved East Longmeadow redstone. “I think we’ve done a good job of capturing the spirit of the building’s exterior in our interior design,” said Dean Stratouly, Congress Group president. To get the open layouts today’s buyers want, they needed to shift the building’s structural load. “We were left with a very compartmentalized interior,” said Eduardo Serrate, an associate at Hacin + Associates, the South End-based architect. “We restructured the entire building with very heavy steel beams so we could offer open-floor plans that maximize light and long views and keep” the ceiling heights of up to 13 feet. Over at 306 Dartmouth St., the Ames-Webster Mansion was designed by Peabody and Stearns and built in 1872. The design is based on the architecture of France’s Second Empire and uses brick, granite, and Connecticut brownstone. Sturgis and Brigham expanded the home in 1882 for Frederick Lothrop Ames, a railroad investor, shovel manufacturer, philanthropist, and Museum of Fine Arts director. The expansion featured a palatial Jacobethan carved-oak hall where Ames hosted balls. A grand staircase ascends to a mammoth Jacobethan oaken mantel and toward John La Farge’s cloister-domed stained-glass skylight, which is surrounded by Jean-Joseph Benjamin-Constant’s mural of Emperor Justinian, his wife, Theodora, Councilor Procopious, and an unidentified woman, as well as a Doge’s Venetian procession. The Ames-Webster Mansion, 306 Dartmouth St., will be a single residence. 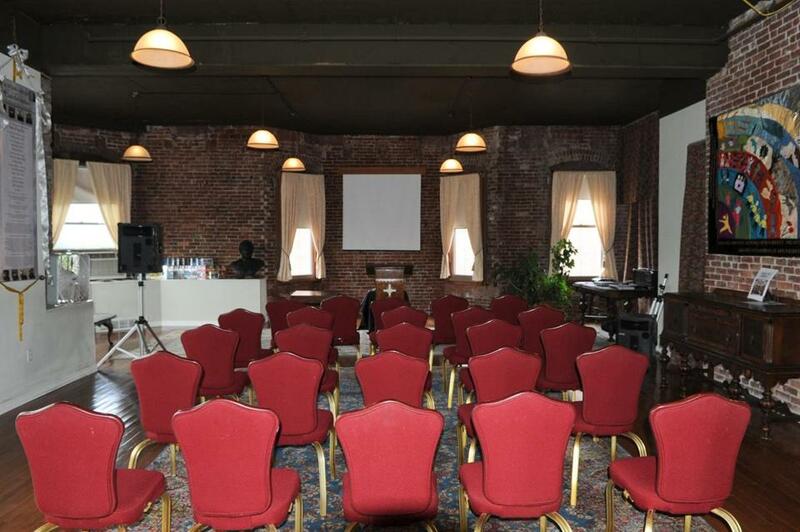 Practicing in a palace was pleasurable at first but confining as the firm grew. Refusing to sacrifice art and craftsmanship for workplace expansion, CBT moved to another Boston location in 2001. Architect Kahlil Hamady, principal of Hamady Architects LLC of Greenwich, Conn., is handling the research on and restoration of the historic interior and the design of the new addition for international investorFahad Al-Athel, whose corporation, FAL Boston LLC, purchased the building for $14.5 million in 2013 . “The procession from the carriage house down the staircase through the hall was very well choreographed and composed by the architect and the owner,” Hamady said. After the restoration, Hamady hopes to renovate upper-level rooms with historically compatible details and extend the back-alley elevation with a bay window and garden. “It’s a gesture to honor the original owner, who was involved with the Massachusetts Horticultural Society ,” he said. The Burrage Mansion, 314 Commonwealth Ave., was converted into four condos in 2002. The original owner of the Burrage Mansion at 314 Commonwealth Ave. was president of the Massachusetts Horticultural Society. 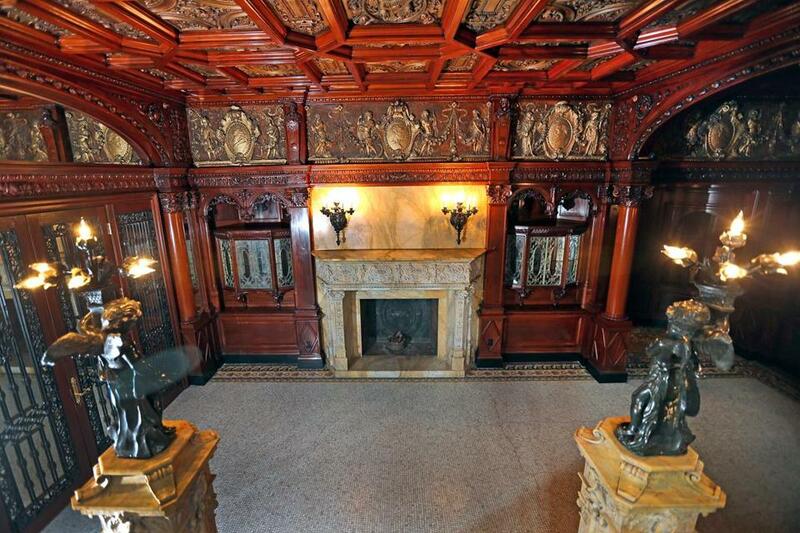 The mansion was built in 1899 as the winter home for lawyer and copper magnate Albert C. Burrage. Architect Charles Brigham adorned its French Chateauesque limestone facade with gargoyles, figurines, cherubs, and lion heads. Interior embellishments include carved mahogany, ornate limestone fireplaces, elaborate plasterwork, stained glass, and a sculpted-marble staircase with newel post statuary. 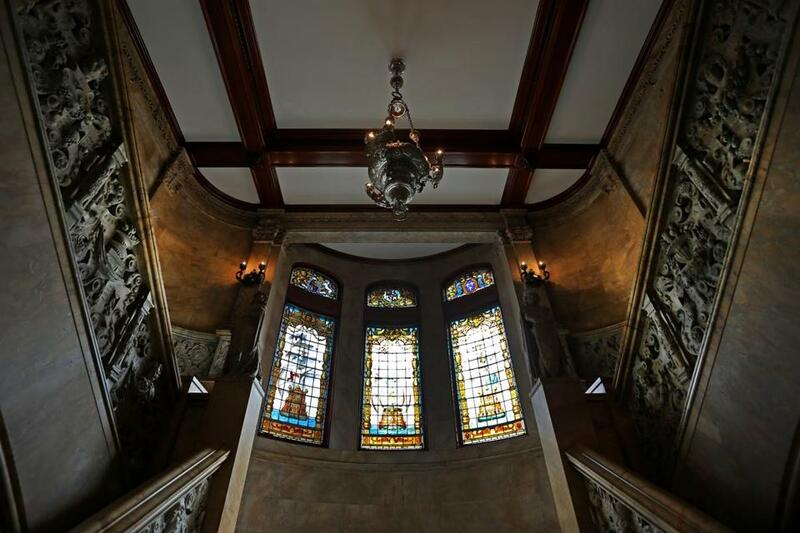 Maintaining this luxuriance proved too costly for the nonprofit Boston Evening Clinic, which vacated the mansion in 1991 after 30 years there and sold it to a developer. It was an assisted-living facility from 1993 to 2000. 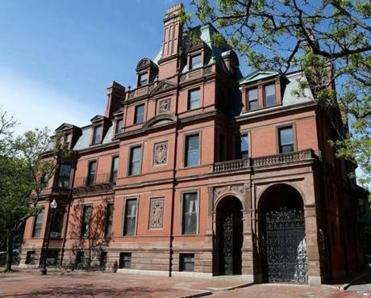 Befittingly, the Burrage Mansion’s 2002 conversion to four two- to four-bedroom condos merited meticulous interior restoration, given the Boston Landmarks Commission’s designation of the vestibule, great hall, grand stairway, and second-floor common hall as landmarks. “One of the major challenges was to remove everything the Evening Clinic had constructed over the years and build out the new construction in a way that protected and restored the original finishes,” said Scott Jenkins, president of project developer ELV Associates of Boston. The mantel’s carving was replicated in plaster mixed with limestone sand. The replacement mahogany panels were carved with computer-driven machinery and hand-finished. The removal of a wall in the conservatory revealed the lava rock on which Burrage grew orchids. The lava rock was incorporated into the kitchen design. Another challenge was to subdivide the lobby without marring its historical integrity. The plans called for a mahogany-trimmed mirror wall with iron-grilled doors to give the illusion of the lobby’s continuity beyond the wall. The units, which range from 3,442to 4,758square feet, all sold in the preconstruction phase. Patriots quarterback Tom Brady bought a unit for $4.12 million in 2004 and resold it for $5.28 million in 2008. The plans called for a mahogany-trimmed mirror wall with iron-grilled doors to give the illusion of the lobby’s continuity beyond the wall. The Boston Landmarks Commission has designated the vestibule, great hall, grand stairway, and second-floor common hall as landmarks. 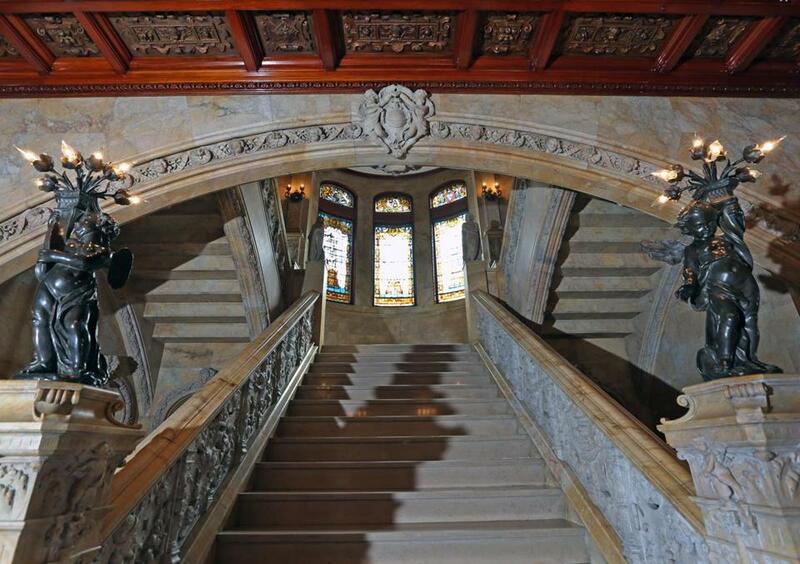 The project restored the stained glass and carved mahogany. 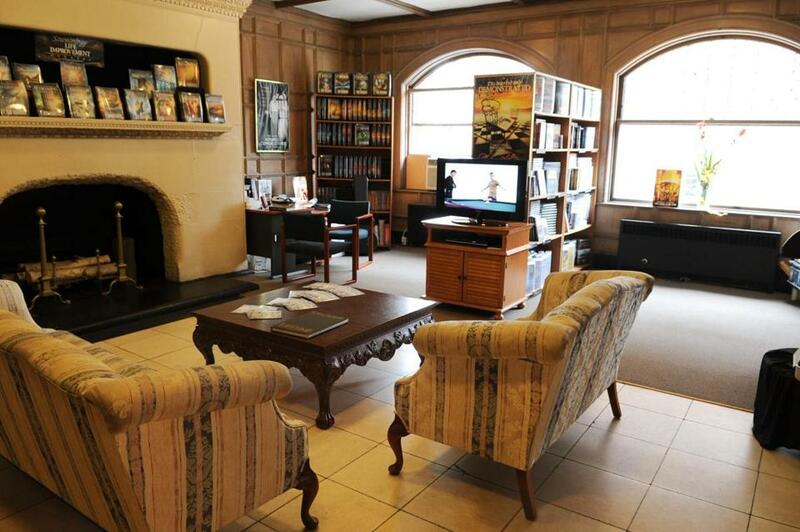 The reception area at the Hooper Mansion when it was the home of Boston’s Church of Scientology.